The How Weird Street Faire wants to thank everyone who came out yesterday, with their colorful costumes and peaceful vibes, to enjoy a day in the sun. Thanks to all the dancers and over 108 DJ’s who shook San Francisco with an earthquake of weirdness. Thanks to the nine music stages who all did an amazing job this year. Thanks to the vendors and artists and performers who showcased the creativity that San Francisco is famous for. Thanks to our wonderful neighbors for putting up with us, allowing us to celebrate in such a beautiful spot. Thanks to everyone who worked so hard to create the best How Weird yet. And thanks to Mother Nature for blessing us with one of the nicest days of the year. prepare to travel to the Dawn of Time. How Weird 2012, the thirteen moons we’ve all been waiting for. where our collective ideas invent new ways of living. Journey to a land of peace. All ages welcome. Costumes and dancing encouraged. Come for the faire, and stay for the after-party! TEMPLE is located between Eden and Shangri La. HARLOT is down Opel Alley past Middle Earth. 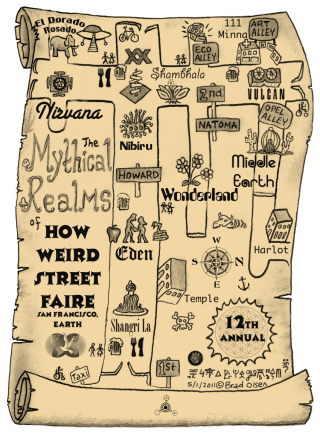 111 MINNA is between Vulcan and Shambhala.